near Judiciary Square in downtown Washignton, D.C. 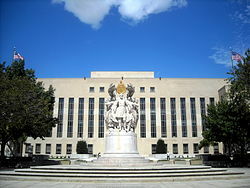 The United States Court of Appeals for the District of Columbia on June 1, 2012, ruled that the Department of Energy (DOE) failed to justify continued payments by consumers of electricity from nuclear power plants into the Nuclear Waste Fund. Since 1982, consumers have paid more than $30 billion into the fund. The court ordered DOE to conduct a complete reassessment of this fee within six months. While the court did not order DOE to suspend the fee payments, the court rejected DOE's bases for continuing to collect the fees.